It has become easier than ever to transfer our data from one phone to another. For instance, if you have a Samsung smartphone, then you can simply move from an existing phone to a Samsung device without experiencing any data loss. 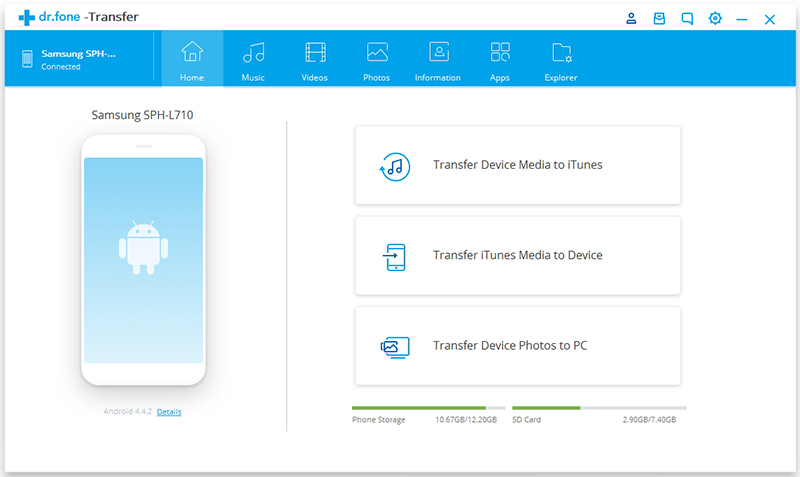 To have a smooth transition from your old phone to a Samsung device or to simply manage your data, you can use a Samsung transfer tool. While there are a few data transfer tools for Samsung out there, not all of them are up to the mark. 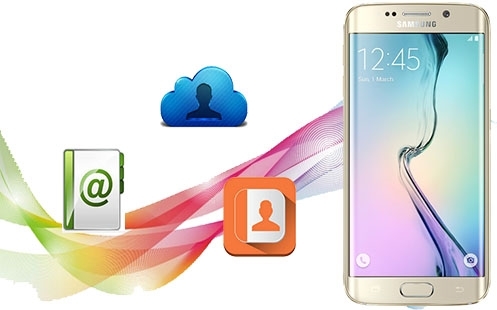 In this guide, we will make you familiar with the three best Samsung file transfer software. If your aim is to transfer your data from one smartphone to another directly, then dr.fone – Switch is just the perfect tool for you. Developed by Wondershare, it provides a one-click and direct device-to-device transfer solution. Not just between Samsung and Samsung, it can also help you move your data from iPhone to Samsung as well. It is an extremely user-friendly and reliable tool that will make the process of switching smartphones quite effortless for you. You can transfer your contacts, photos, videos, music, call logs, messages, and all the other data types. With just one click, you can move any data type. It supports the transfer of data between similar devices (like Samsung to Samsung) and a cross-platform transfer of data as well (like iPhone to Samsung). The quality of data is not compromised during the transfer. An extremely secure software, it won’t access or leak your data. Compatible with all the leading Android and iOS devices. This includes all the major Samsung devices as well. How to use dr.fone – Switch? Simply launch dr.fone – Switch on your computer and connect both the devices to it. Verify the source and the target device and select the type of data that you wish to transfer. Click on the “Start Transfer” button and wait for a while as it will move your data from the source to the target device. That’s it! Once the transfer is completed, you will be notified. This is a dedicated phone manager developed by Wondershare. With dr.fone – Switch, you can only perform a device-to-device transfer. Though, with dr.fone – Transfer (Android), you can manage your data in different ways. This includes transferring it between your phone and computer, between different phones, and even between your phone and iTunes. You can preview your data, get rid of something, edit certain information, and do so much more. All of this makes it a complete Samsung transfer and manager. You can transfer your data between your Samsung device and the computer as well as between two different smartphones. It also supports the cross-platform transfer of data (for instance, iPhone to Samsung and vice-versa). You can transfer all kinds of data like photos, videos, music, contacts, messages, and so on. The tool categorizes the data and provides its preview so that we can transfer it selectively. You can even rebuild your iTunes library (without using iTunes) by importing data from your Samsung phone. It is fully compatible with all the leading Samsung (and other Android) devices. The desktop Samsung transfer application runs on Mac and Windows PC. How to use dr.fone – Transfer (Android)? To use dr.fone – Transfer (Android), just launch the application and connect your Samsung device to it. On its home, you can access all the related shortcuts. Just click on any option to access the feature. Furthermore, you can see different tabs for every type of data on the interface. Just visit any tab to access the data on your Samsung phone. From here, you can delete your data, import something from your computer, and even export data from your Samsung phone to your computer or any other device. 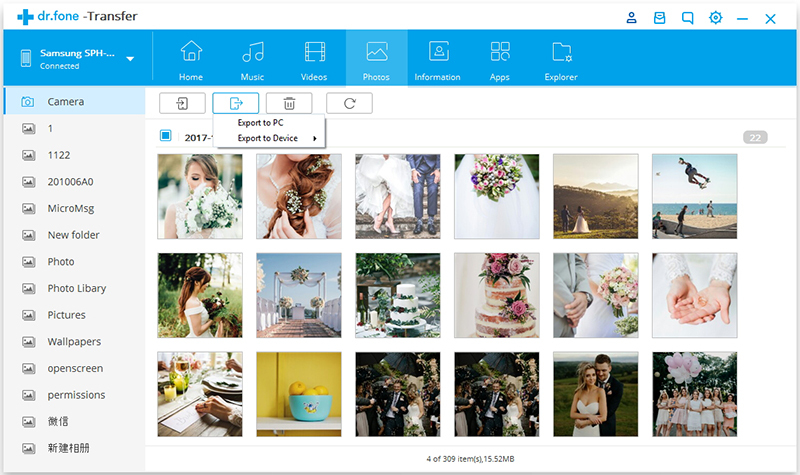 You can even access your apps and get an in-depth view of your data with its file explorer. 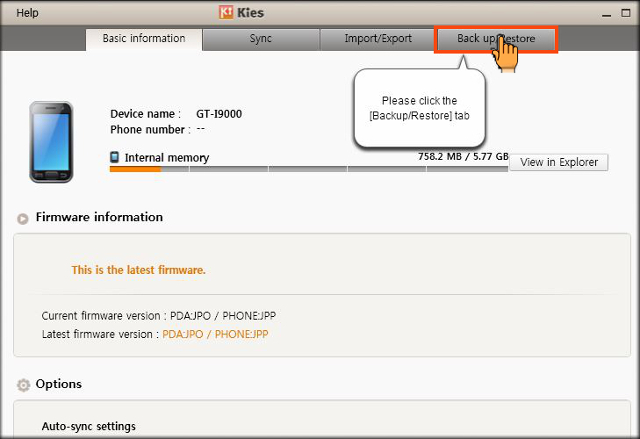 Kies is a freeware that is developed by Samsung. Ideally, it is the default tool that can help you manage your data on a Samsung device. Besides using it as a Samsung transfer tool, you can also use it to take a backup of your data and restore a backup. Since it is available for free, a lot of users try it at first. Nevertheless, due to its limitations, users often switch to other Samsung transfer applications. Freely available and is compatible with the feature Samsung devices. Though, it might not work with the latest devices (for them, you can use Smart Switch). You can easily transfer data to and from your Samsung device and the computer. Supports the transfer of photos, music, videos, contacts, and more. It can also be used to sync your data between your computer and your Samsung device. The tool can further take a backup of your data and restore a backup as well. There is no support for transferring apps. 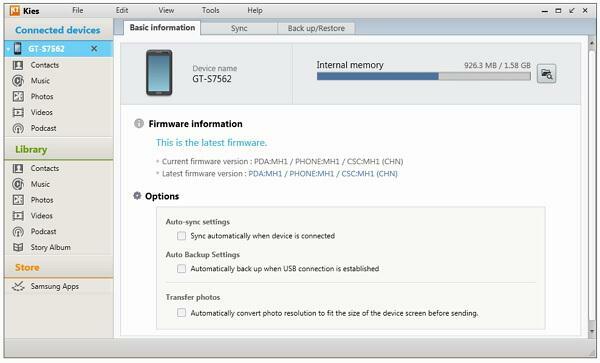 How to use Samsung Kies? Firstly, you need to download Samsung Kies on your Windows or Mac from its official website. 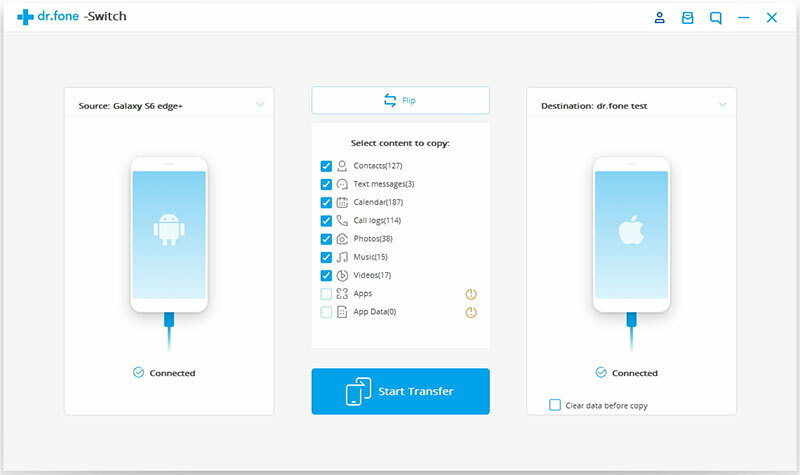 To use this Samsung transfer tool, launch it and connect your device to the system. Select your device and go to different tabs (like Music, Photos, etc.) to access their data. From here, you can import/export your data as well. Besides that, you can go to the “Sync” tab in order to sync your device with your computer. There is also a tab for Backup/Restore, which can help you take a comprehensive backup of your device or restore data from an existing backup. Now when you know about the top Samsung transfer software, you can easily pick the best one. Ideally, if you wish to perform a direct device-to-device transfer, then we recommend using dr.fone – Switch. In order to manage your Samsung device and import/export data to/from different sources, dr.fone – Transfer (Android) is preferred.